When life gets too stressful and we crave the ability to stop time, dreams of escaping to a deserted island become our only route to peace and solace. However, what seems like illusory images of remote jungle set against a coastline of pure white sand are only too real in the uninhabited atolls scatted like pearls in the Polynesia and Oceanic realms. Thought to have inhabited by early Polynesian settlers in the 13th century, and then rediscovered as deserted in 1806 by Captain Abraham Bristow, the Auckland Islands are the largest of New Zealand’s Subantarctic Islands and contain a rich history of civilisation, and impressive wildlife and plantation population and the infamous eight shipwrecks caused by these island’s unforgiving shores. Listed as part of a World Heritage Site, these Islands are one of New Zealand’s most protected natural areas. For bird enthusiasts, Enderby Island has a strong hold on the rare yellow-eyed penguin, with a considerably high proportion of this species choosing to breed here. There is an abundance of other flying feathery friends that habitat these lands, such as the peculiarly named Wandering Albatross, Sooty Shearwater and the Auckland Shag. Wildlife also prevails under the waves, as by the 21st century, the Auckland Islands were the primary breeding ground for the adorable but once endangered New Zealand Sea Lion. Despite attempts of human habitation on the Auckland Islands throughout the 19th century failing, the terrain here actually produces the richest flora of the New Zealand Subantarctic Islands, and since the introduction of pigs, goats, rabbit and cattle, the vegetation has sprouted tremendously too! These islands in Kiribati are the most protected marine conservations in the world, and were added to the UNESCO World Heritage list in 2010. This mid-ocean wilderness situated halfway between Hawaii and Fiji includes eight sublime atolls, thirty submerged volcanoes, two submerged reefs and huge deep-water tracts, which make up one of Earth’s very last unspoilt coral archipelago ecosystems. Having evolved virtually untouched by man, the reef and atoll systems provide not only a pristine captivating beauty as unknown species glide through its clear waters, but they also provide scientists with invaluable information about the ecological damage human impact has upon nature. The coral reefs in The Phoenix Islands are jewels of the ocean, still preserving the stunning aesthetics from over 1,000 years ago; a shining example of what all reefs around the world should look like if man had not intervened. Although a boat trip from Fiji can take five days to reach this fantastic oceanic jungle, and plane rides are exclusive and very limited, the spectacle of such a rare sight will take your breath away and leave you feeling happily weightless and almost insignificant, as you peer into the depths of a much older and larger world. This long rugged island with a backdrop of tropical rainforest is part of the Solomon Islands, and is the largest uninhabited Island in the South Pacific. With stunning coral reefs fringing its border, and surrounded by calm turquoise waters, this island is home to one of the Solomon Island’s leading conservation projects to protect the island from logging and other resource exploitations. Known as the ‘Last Wild Island’, it is a land forgotten by time, having been uninhabited for 150 years. Mystery creeps through the shadows and hide in the trees, as it is still unexplained as to why the island was abandoned so suddenly. Many stories have been told in the Solomon’s, including a fear of head-hunting, ill health caused by curses and dangerous gossip that led to civil breakouts. However the true enchantment of this island lies in its extraordinary untouched landscape and waters, despite the owning country having lost all of its forests to commercial logging. Nestled in the white sandy beaches you’ll see three species of turtle, including the highly endangered Leatherback Turtle. With a dazzling variety of plants and animals such as Spinner Dolphins, Coconut Crab and Parrot Fish, this island attracts visitors from all over the globe. The Rock Islands of Palau were created when ancient relics of coral reef violently surfaced, creating these peculiarly shaped formations situated in Palau’s Southern Lagoon between Koror and Peleliu. Compiling of up to a staggering 300 islands in total, the Rock Islands were titled as a World Heritage Site in 2012 due to their surreal beauty and abundant marine life. The main attractions of these uninhabited islands are their famous beaches and blue lagoons; serene and tranquil. The Rock Islands waters contain some of the most varied sea life in the world, supporting over 1500 species of coral and pelagic fish. Even if you don’t fancy venturing into the depths, the terrain is home to many land animals to encounter including crocodiles (although this isn’t preferred! ), fruit bats and an array of exotic birds. The weird shapes of these scattered islands also draw much attention. The bases of these islands have fallen victim to water erosion and urchins and fish that constantly graze on the algae, causing the unique mushroom or umbrella-like shape that these islands possess. Discover the mystery that surrounds the skeletal remains of the ‘tiny people’, which suggests that human settlement was attempted numerous times over the past several thousand years. 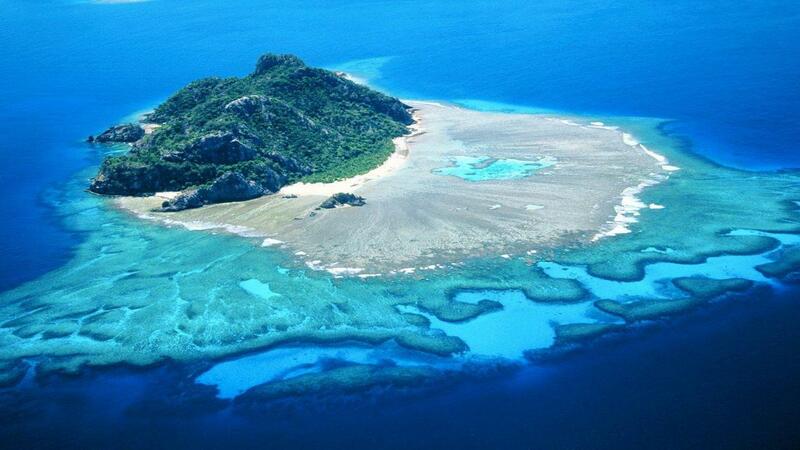 This tiny island (pictured) lies in the collection of the Mamanuca Islands of Fiji, a volcanic archipelago consisting of around 20 islands, where many get submerged during high tide. Although small, it has a stunning array of coral reefs, calming lagoons and pristine sandy beaches, not to mention its starring role in the Tom Hanks film Castaway. Fringed with swaying palm trees and a serenity to calm any mood, Monuriki is a place of beauty, but its stunning flora and fauna are a focal interest, as it’s one of only three islands in the world to house the endangered Fiji Crested Iguana. Monuriki is also rich with bizarre plantation such as the Fish Poison Tree whose seeds are used by fishermen in the South Pacific to suffocate fish in tidal pools. Catch sightings of the endangered Hawksbill Turtles who munch on the sponges of the coral reef, or venture further into the island to find curiously shaped flora species seen nowhere else on the Earth. As you journey through the island you’ll undoubtedly stumble on the cave seen in Castaway where Tom Hanks found refuge on the infamous stormy night. However the reality of survival on this island is somewhat different to the films portrayal due to the lack of fresh water available. You don’t have to be Robinson Crusoe to explore these uninhabited islets of the ocean, as many tourists venture by plane or by boat to see these truly magical sights, that leave you breathless and in awe that the world can actually be a beautiful place.